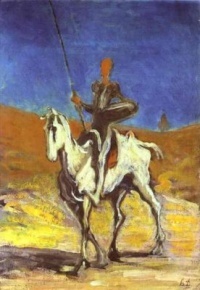 Don Quixote, hopeless romantic and idealist, hence the word quixotic. Beginning with Immanuel Kant, German idealists such as G. W. F. Hegel, Johann Gottlieb Fichte, Friedrich Wilhelm Joseph Schelling, and Arthur Schopenhauer dominated 19th-century philosophy. This tradition, which emphasized the mental or "ideal" character of all phenomena, birthed idealistic and subjectivist schools ranging from British idealism to phenomenalism to existentialism. The historical influence of this branch of idealism remains central even to the schools that rejected its metaphysical assumptions, such as Marxism, pragmatism and positivism. In general parlance, "idealism" or "idealist" is also used to describe a person having high ideals, sometimes with the connotation that those ideals are unrealisable or at odds with "practical" life, or naively at variance with empirical observations of the real world. In this sense, its antonym is realism. Subjective idealists like George Berkeley are anti-realists in terms of a mind-independent world, whereas transcendental idealists like Immanuel Kant are strong skeptics of such a world, affirming epistemological and not metaphysical idealism. Thus Kant defines idealism as "the assertion that we can never be certain whether all of our putative outer experience is not mere imagining". He claimed that, according to idealism, "the reality of external objects does not admit of strict proof. On the contrary, however, the reality of the object of our internal sense (of myself and state) is clear immediately through consciousness." However, not all idealists restrict the real or the knowable to our immediate subjective experience. Objective idealists make claims about a transempirical world, but simply deny that this world is essentially divorced from or ontologically prior to the mental. Thus Plato and Gottfried Leibniz affirm an objective and knowable reality transcending our subjective awareness—a rejection of epistemological idealism—but propose that this reality is grounded in ideal entities, a form of metaphysical idealism. Nor do all metaphysical idealists agree on the nature of the ideal; for Plato, the fundamental entities were non-mental abstract forms, while for Leibniz they were proto-mental and concrete monads. Combat des écoles. - L'Idéalisme et le Réalisme , a lithograph by Honoré Daumier. Unless indicated otherwise, the text in this article is either based on Wikipedia article "Idealism" or another language Wikipedia page thereof used under the terms of the GNU Free Documentation License; or on original research by Jahsonic and friends. See Art and Popular Culture's copyright notice. This page was last modified 08:05, 7 February 2019.